Et stenkast fra Checkpoint Charlie i Berlin Mitte ligger denne lyse og stilfyldte 2-værelses penthouse-lejlighed i området ved den berømte Friederichsstrasse. Potsdamer Platz ligger i gåafstand med sine imponerende bygninger så som Sony Centret og Berlinale Palast, der udgør kernen for Berlins internationale filmfestival.Selve lejligheden nyder godt af de store solvendte vinduer og det rummelige opholdsværelse. Der er sovefaciliteter til op til 4 personer, såvel som spisebord, TV, DVD-afspiller og anlæg. Både badeværelset og køkkenet er veludstyrede. Det topmoderne trinettekøkken byder på alle nødvendige faciliteter så som køleskab, kogeplader og opvaskemaskine til et morgenmåltid på sengen eller en let og hurtig frokost. Den rolige altan er desuden et glimrende sted at afslutte dagen med en drink mens du nyder udsigten over indre Berlin.Lejligheden er ideel for familier på op til 4 personer, såvel som for par og mindre vennegrupper, der ønsker at opleve byen i eget tempo med god adgang til seværdigheder, restauranter og museer inden for et par hundrede meters afstand. Marmorbadeværelset er udstyret med en rummelig og helt nye walk-in bruser. Badeværelse med luksus bekvemmeligheder. This was my first stay at this apartment and I couldn’t have been more impressed. We arrived late at night and were expeditiously checked in and escorted to our apartment that was beautiful and QUIET (we are light sleepers). The bed was very comfortable, and the room/bathroom were immaculately clean. The terrace is a WOW and location is unbeatable. We really enjoyed the staff; everyone was very polite and accommodating. We were sad to leave, but we will definitely be back! My husband and I stayed here for a week and we couldn’t be happier. When we got there we asked to check in early if possible. We were nothing short of amazed with the view of the terrace. We woke up every morning to the Checkpoint Charlie from our balcony! The kitchen had all we needed. The location of this apartment is PERFECT. You can get to all the great sites by walking. (Otherwise the Underground is so easy to use). Such an epic view and we will definitely stay again. I’m so happy to join the chorus of satisfied customers at this gem of a penthouse. I booked a stay here after reading the wonderful reviews left by past customers and want to say that we were not disappointed. From check-in to check out, our experience was about as perfect as could be. The location is the TOP for everything and also close to two tube stations which made sight-seeing a breeze. The terrace faced the Checkpoint Charlie! Great view. My pre-trip correspondence with the owner was very helpful. I hope to return there on my next trip and highly recommend it to anyone looking for a wonderful apartment with good value. This was the nicest, best apartment and customer service we have ever stayed at. From the soft pillows and linens, steaming hot shower with tremendous water pressure to the fantastic service, this apartment really impressed us. Will definitely stay here again next time we are in Berlin! I wouldn't pick anywhere else! What I remember most is the sensation of feeling genuinely welcomed. The apartment was immaculate, the view from the terrace was to die for. Speaking of food, the Michelin restaurant in front of the building was sublime! My wife and I travel to Berlin yearly for the past half decade. Suffice to say, this will be my sole choice when visiting Berlin for the foreseeable future. 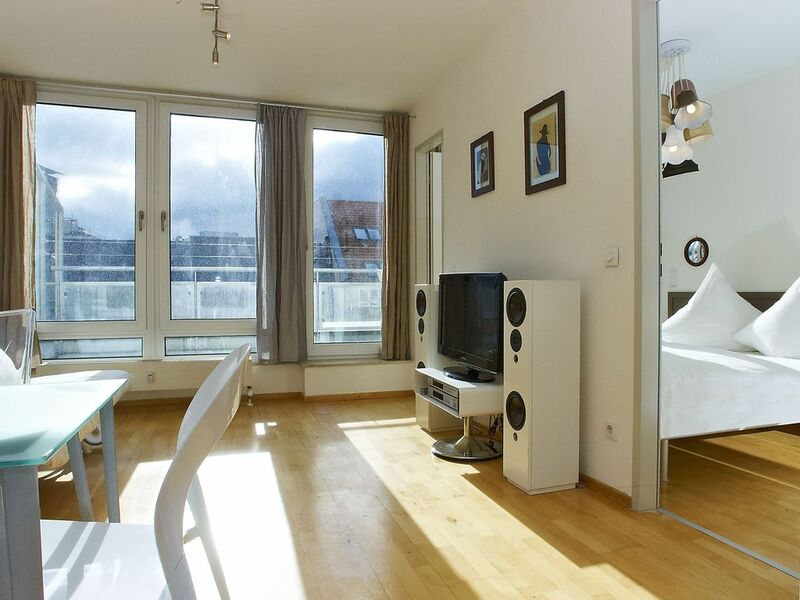 This is a fantastic attic, smack-bang in the center of Berlin. Easily reachable and very comfortable with a terrific terrace. The apartment was spotlessly clean and personnel was very friendly and service-oriented. An absolute recommendation! Der er glimrende transportforbindelser med Checkpoint Charlies undergrundsstation som den tættest beliggende med adgang til resten af Berlin. Herfra kan du f.eks. besøge parlamentsbygningen Reichstag med sin moderniserede kuppel og derefter tage på museumsrundtur på Museumsinsel ved Spree-floden. Om aftenen kan du udforske Østberlins vilde og spraglede udvalg af barer. CANCELLATION POLICY Conditions differ according to the payment method: ONLINE PAYMENT •	more than 60 days before arrival, the owner will return 100% •	less than 60 days, the owner retains 100% Balance can be payed in cash at check-in or by international bank transfer at least 15 days before check-in.